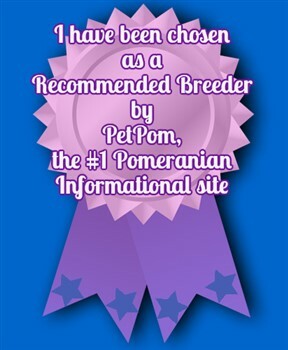 ** LAST UPDATED APRIL 21 , 2019 WELCOME TO MY AVAILABLE PUPPIES PAGE, PLEASE FILL OUT THE QUESTIONNAIRE! ❤ OUR FIRST FURBABIES HAVE ARRIVED, PICTURES BELOW!!!! Welcome To Our "Available Puppies Page"
" WE HAVE PUPPIES! " We DO NOT guarantee the color, size, breeding or show quality of the Pomeranian, only the health of the Pom at the time of sale against life threatening illness that may be discovered during the 72 hour health guarantee. We can only give a guesstimation of the potential adult weight through parents sizes and a chart we refer to. Most of our puppies average in size from 3 to 7 lbs but some may be larger or smaller. We require a Non-Refundable deposit to hold a puppy for you with the balance due in full by age 7 weeks old. If for any reason you change your mind about the purchase of the Pomeranian, you will lose your deposit and all monies paid toward the puppy and the puppy will be relisted as available. Please be aware of these issues before commiting to purchase one of our babies. AKC COCO BORN 3-29-19 TO MYSTERY & NOAH. ONE SOLID BLACK FEMALE (SOLD) AND ONE CHOCOLATE PARTI MALE.